There are many strong and powerful people in the world. In fact, the power to control things is present in each individual. We want things our way, and so we do what we can to orchestrate circumstances to our advantage. This can be done in a passive-aggressive way, which is the indirect expression of hostility, or it can be done openly where verbal or physical harm to others is the outcome. Whatever the reason for these negative behaviors, those who struggle with them feel that they can gain control over others and get their own way. These powerful people disrespect authority and feel they have the right to be in charge. 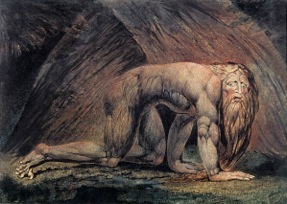 A biblical example of a strong and powerful man is Nebuchadnezzar. He was the ruler over all Babylon, the world’s most powerful ruler of the day. He had the ability to control the affairs of his kingdom and of his people, and his subject’s lives were ones of fear and dread. He had the authority, the resources, and the position to dictate the outcome of every life for good or for bad. But there was something that King Nebuchadnezzar didn’t understand. While the words were still in his mouth a voice came from heaven proclaiming his doom. Immediately God removed Nebuchadnezzar’s authority and the man went crazy. He became like a beast and was driven away from mankind. He lived in a field and ate grass like the cattle for a period of seven years until he learned the truth. He finally recognized that the Most High was the Supreme Ruler over the realm of mankind and that any power he had been given was the result of this God Who was stronger than he. What a warning and a comfort I see in this story! For those of us who like to have control, we would do well to acknowledge the One Who has complete authority in all the affairs of men. There is no place for pride in a believer’s life. All we have has been given us by the Most High and He can take it away at any time. Whether you are the controller or are being plagued by a controller, always keep in mind: Where there are strong people, there is a stronger God!